Hi, I am fascinated by the John Bowkett tuned BSA Meteor. I've never seen one in real life, but the story of John tuning them in the eighties for 23 pounds to produce nearly 12 ft/lbs and still be (quite?) smooth - cool. Has anyone got one? Any experiences? I have 2 Meteors: a Mk1 and a Mk5. The Mk1 is nicer to shoot and better made. The Mk5 has a lot of potential for improvement, methinks. 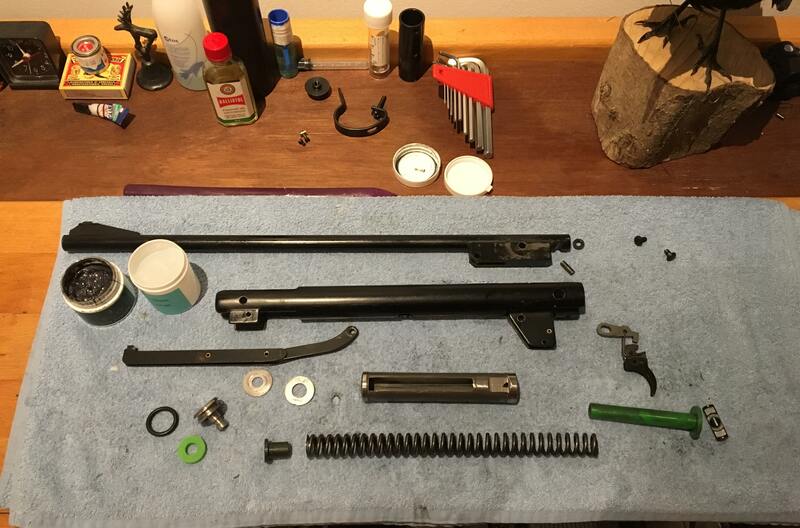 I will try to make it smoother (polishing, a nylon spring guide and top hat, new piston seal and piston buffer washer, a new spring). I know that a Meteor will never be a fantastic gun, but there's pleasure in improving things and getting the best out of something really simple and cheap. have a meteor circa 1974. It was bought by my father second hand when I was 7 so early 70's build I assume. Yep the old really crude open sights that are extremley accurate at typical close ratty ranges. 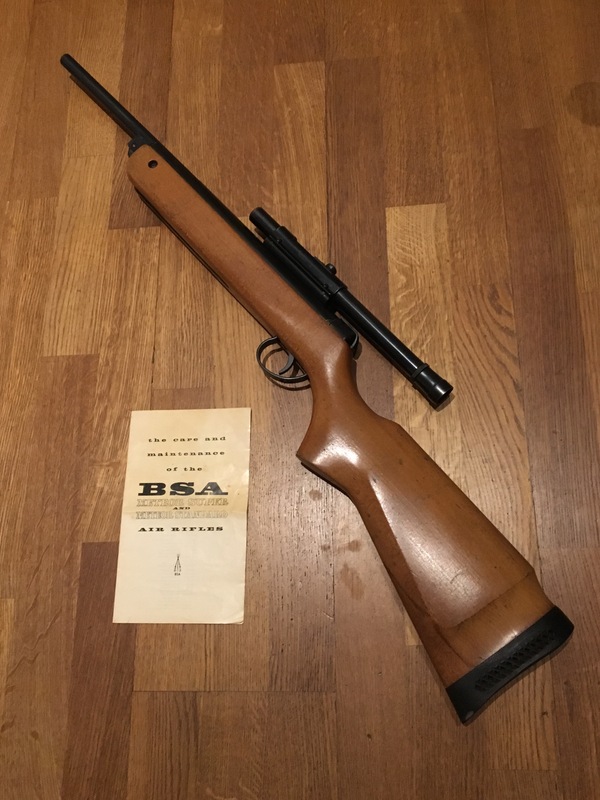 Such a shame that BSA did not realise that cutting corners by using a pin to hold the barrel into the breach prevented the gun from competing with it's German rivals - 10% more spent on production would have made the gun 100% better. should have done it inthe first place !! IMHO Ditchie, the Mercury was never going to be in the same league as the 77 and once people started buying and experiencing the Germans potential it was going to be something rather special to halt the 77 Train, we had to wait for the TX to be born to compete. 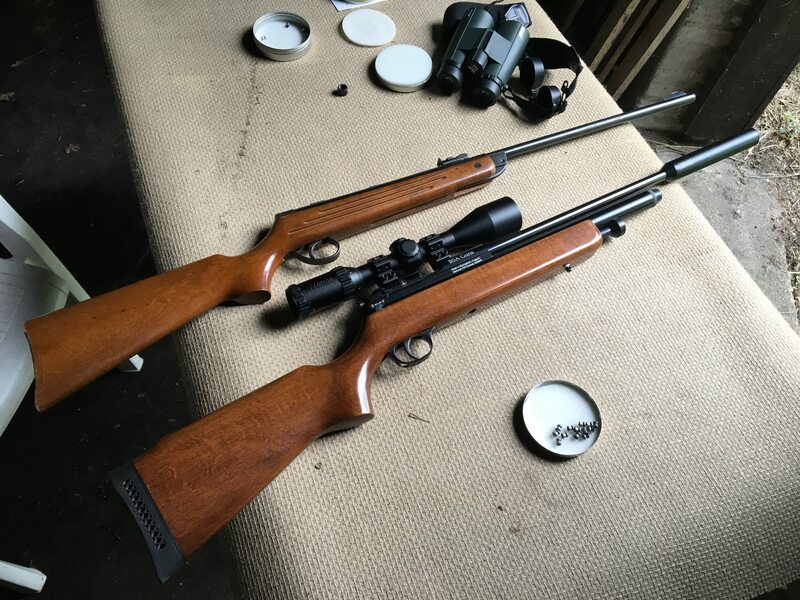 at the moment im shooting a merc "S" 177 against a 77 ....22 and at the mid distance there isnt a lot in it between the two of them...but as you say ....BSA did it too late.. 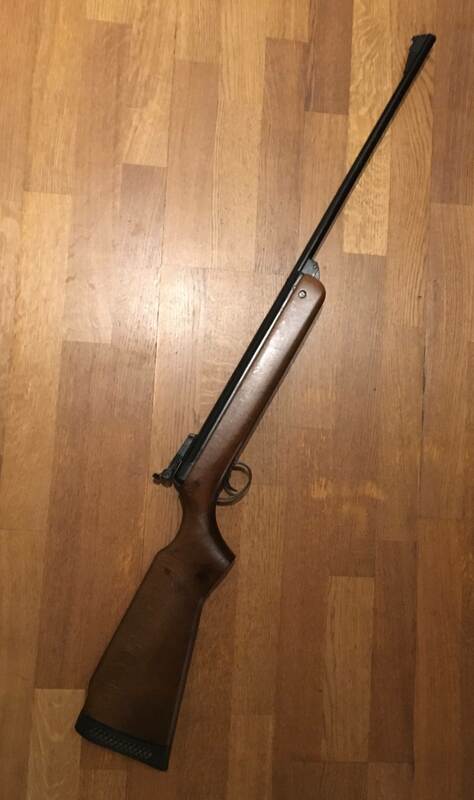 But you have spent considerable time and skill "fettling" the S - the vast majority of Airgunner's would find it difficult to sharpen a pencil without gaining a pointy finger - as for the weight, pretty sure that my 77 and my sexual self sufficiency were both instrumental in building my biceps . There's an easy solution to improve the barrel lock-up: I put a few steel washers in the barrel latch hole, to increase the barrel latch spring tension. It locks up very tight now. I have also managed to improve the Meteor's handling, accuracy and power considerably. I fitted a nylon spring guide and top hat from Chambers, and polished the internals (cylinder, inside of piston, outside contact points of piston, spring ends, cocking slot, cocking arm shoes). Quite easy measures. The polishing I did with 1200 wet&dry, then 2000, then Autosol, then a good rinse. There are still a few things I need to try: drill out the transfer port to 3.2 mm or more - try a quad seal (I found quad seals that should fit; they have 2 instead of 1 sealing surface, so they should improve efficiency) - take 2mm off the piston head for a longer stroke - try a shorter spring (2 or 3 coils less) - fit a bolt at the end of the cylinder to act as a scope stop (the 13 mm Sportsmatch mounts are very good, but after 50 or so shots they had moved backwards about 2 mm). I might also try to fit a Lightning trigger mechanism. Have got a spare one on a Spitfire donor gun. Not sure if this will make a difference, but it's easy enough to try out: it's a matter of drilling 2 holes in the Meteor's trigger casing (the dimensions of the trigger casing are the same in the Meteor/Lightning/Spitfire). Lastly I'd like to experiment with a piston weight. It might all sound a bit crazy, for a Meteor, but it's giving me a lot of fun and I'm determined to get it as nice as possible. You could park your Car behind the latch but that will not stop the sides of the breach wearing and allowing the barrel to move side to side - despite going thru 6 MK's BSA still do not fit shims to the Meteor and ,as the block part of the barrel assembly is not hardened, sooner or later this area is going to fail to such a point that accuracy will suffer. Tbh I'm getting very good accuracy out of my 2 Meteors. They are a joy to shoot. The carbine one has a Lightning barrel and a red heavy duty HW breech seal. Some quad rings will arrive today, which will improve the sealing of the piston. There is no barrel wobble on the Meteors whatsoever @bruno22rf, don't get me wrong, I understand that you have experienced this, but for now this well used seventies Mk4 and eighties Mk5 are great guns for 60 and 70 pounds, plus about 40 pounds each worth of new parts (seals, springs, spring guides, top hats). Light, cheap, easy to shoot, disassembled in under 5 minutes. Pretty much my wish list for a fun springer. A quick update: the Mk4 is now running at 10.1 ft/lbs, and very smooth. New spring, beer can piston sleeve, quad ring. The quad ring makes a great difference. It seals way better. Saw a mint Mk 4 for sale at the local clay club at £100. It was still in it's cardboard box with the original iron sights and bits and a telescopic sight still in the wrapper, oil bottle and target holder with targets. Seemed like a good buy if you are into those things. about 5 years ago i bought a meteor mk7 177,for my then partners son,it allways chronoed 0ver 12 ft lbs,straight out of the box,but he didn,t keep it long,wonder how many others were like that? Hi, I believe the Mk7 and Mk6 are totally different guns than the Mk1-5. Mk1-5 is more or less the same gun, with slight variations. The Mk6 and 7 are probably more powerful out of the box. My latest Meteor concoction. Nice and "spacey". The old Weaver needs to be this set back to get a good sight picture. It shoots so smoothly, and that Mk4 trigger is light and predictable. Polishing helps a lot. 10 ft/lbs and accurate. Old school British guns have character, don't they! I had two, one in. 25 that was awful but only because it was pellet fussy but my 22 was good.